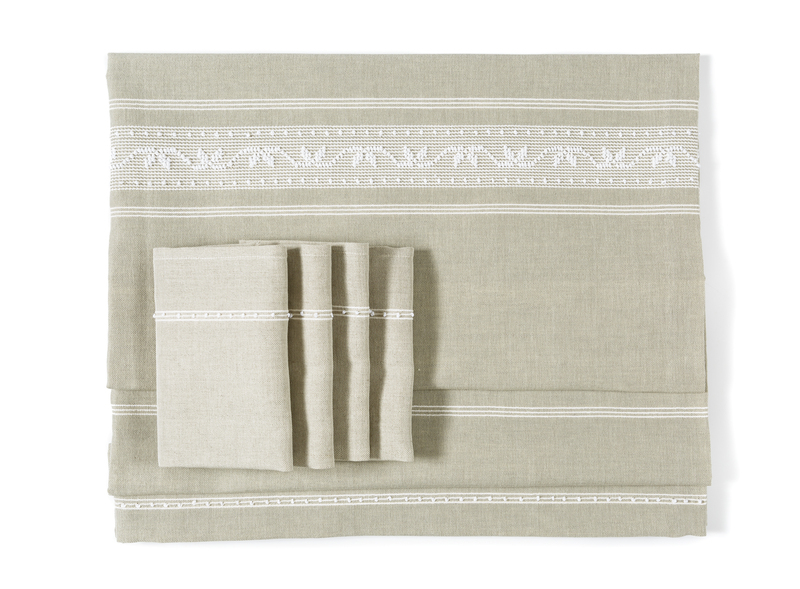 These fine cotton and linen curtains are decorated with band motifs taken from the handicraft textile tradition, crafted using the artisanal pibiones relief technique. Available in multiple colours and compositions, they can be customised in shape and size. 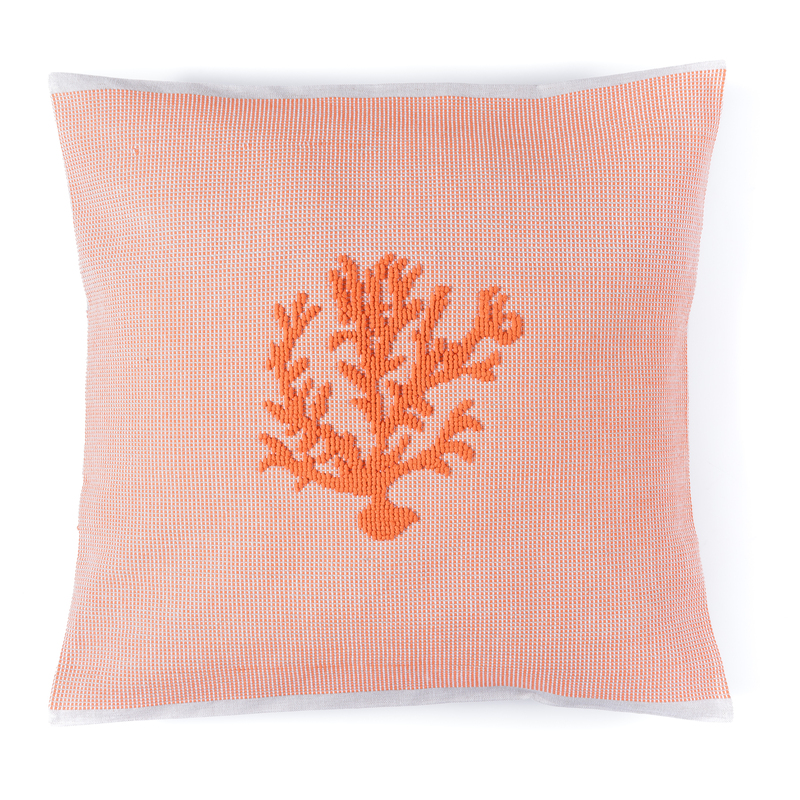 Bright vibrant colours characterise these fine linen cushions with relief decorations crafted by hand according to the semipieno (half bodied) pibiones technique. Elegant carpet realised using the pibiones relief technique with design and colours inspired by elements of the sea, it can be customised in colour and size. 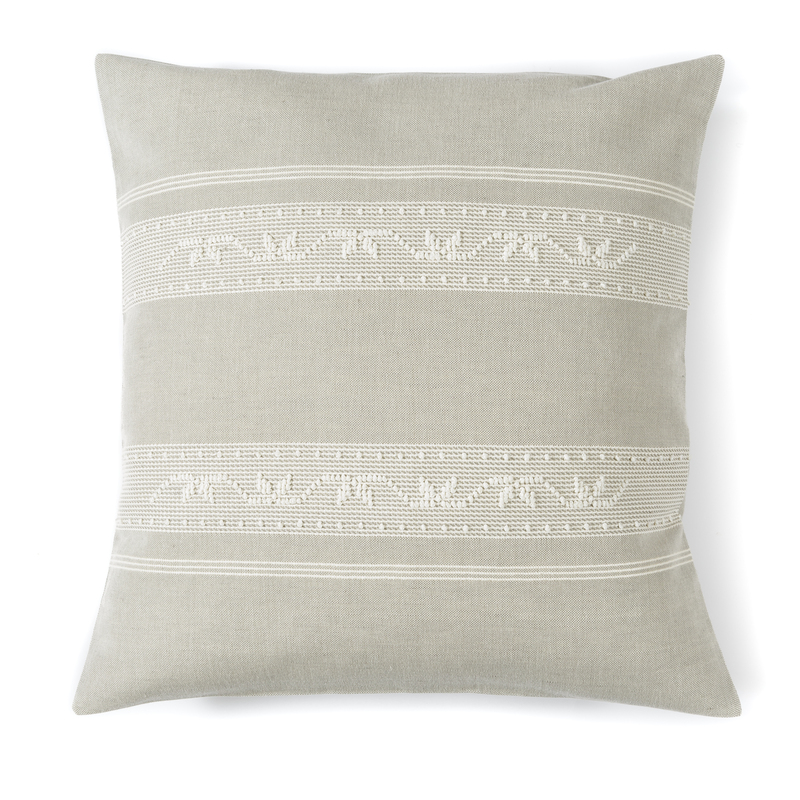 The sophisticated neutral shades of grey and white characterise these sophisticated linen cushions with relief decorations crafted by hand according to the semipieno (half bodied) pibiones technique. 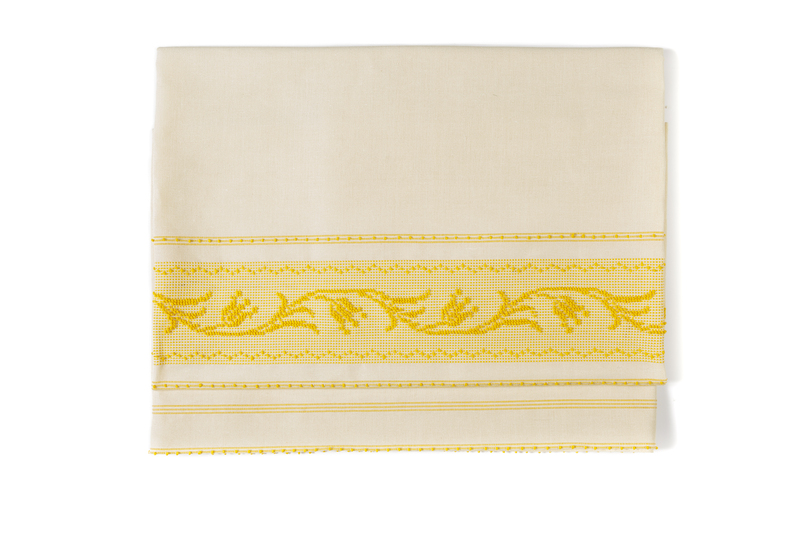 Cotton and linen tablecloths and napkins crafted by hand according to the pibiones relief technique with the stylised myrtle leaf in ecru and neutral colours together with yellow tulip motifs against a neutral background. In the Laboratorio Tessile Corona in Muravera, the three sisters Flaviana, Simona and Sandra Fanunza, keepers of ancient and invaluable knowledge which they skilfully and elegantly reinterpret, work with passion and a sensitive artisanal approach. 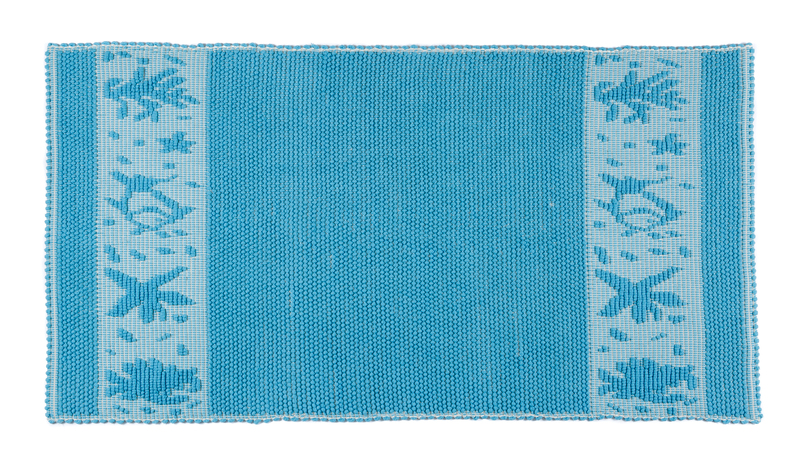 Their mother Barbarina Corona and her sister Antonia, both expert weavers, set up this textile workshop back in 1976, which specialised from its early stages in the production of fine fabrics with strong ties to the local textile tradition, carpets and drapery with delicate patterns and elegant colours, which reflect the main techniques and decorative motifs. In 2002, Flaviana, Simona and Sandra, who have always actively contributed to the rich history of the workshop characterised by remarkable collaborations and exchanges aimed at investigating traditional techniques and tools, took over its management. The Corona textile workshop, which is spacious and welcoming, is equipped with numerous and diversified looms, including antique looms made with juniper wood. They are devoted to their profession and expertly craft a variety of products, carefully assisting their customers in the personal choice of carpets and décor fabrics which are characterised by fine craftsmanship and the utmost care for decorative detail and high-quality natural yarns. Their production is sold both in their workshop and in their showroom, Il telaio di Fanunza, in the central via Roma in Muravera. Great flexibility in meeting the highly personal needs of the clientele characterises the production, which can be realised using many techniques thanks to the numerous and diverse looms available. Carpets of different sizes, bedspreads and fabrics for the bedroom, cushions, curtains, tablecloths and other coordinated cotton, linen, wool fabrics are crafted according to the pibiones relief technique and with geometric motifs known locally as a prialeddu, which are ideal for all the rooms of the house or for the bedrooms and common areas of accommodation facilities. In the Laboratorio Tessile Corona, the typical local weaving techniques a prialeddu - geometric dobby weaves (patterns made with a dobby mechanism) - and a pibiones - relief motifs – are performed, combined with handloom and semi-automatic loom weaving according to the specific requirements of the product, using natural cotton, linen and wool yarns.